The invention relates to radio link establishment, and in particular to a method of establishing an association between user equipment configured to communicate with other user equipment via a direct radio link within a wireless communications network. A computer program product and user equipment are operable to perform that method. The method comprises: monitoring, at one of the user equipment configured to communicate via a direct radio link, for receipt of a beacon signal from one of the other user equipment; and if such a beacon signal is received, notifying the user equipment transmitting the received beacon signal of receipt of the beacon signal to establish an association with the user equipment transmitting the received beacon signal; and if no beacon signal is received, commencing transmission of a beacon signal and monitoring for receipt of a notification that the transmitted beacon signal has been received by one of the other user equipment to establish an association with the other user equipment responsible for transmission of that notification. Aspects and embodiments described may allow user equipment wishing to establish a device to device link with other user equipment to discover each other without each having to transmit a beacon signal. 本发明涉及一种在无线通信网络内的被配置为经由直接无线电链路与其他用户设备进行通信的用户设备之间建立关联的方法；可操作为执行该方法的计算机程序产品和用户设备。  The present invention relates to a configuration method for association between a user equipment communicating via a direct radio link to other user equipment within a wireless communication network; a computer program product operable to perform the method and user device. 无线电信网络的组件通常包括通过该无线电信网络进行漫游的用户设备。 Components  The wireless telecommunications network typically includes a user equipment roaming through the wireless telecommunication network. 基站(例如，eNodeB)被提供，它们支持无线电覆盖的区域。 The base station (e.g., an eNodeB) is provided, which supports the area where radio coverage. 多个这样的基站被提供并且在地理上进行分布，以便于向用户设备提供宽广的覆盖区域。 Such a plurality of base stations are provided and are distributed geographically in order to provide a wide coverage area of ​​the user equipment. 当用户设备在由基站服务的无线电覆盖的区域内时，通过相关联的无线电链路， 通信可以建立在用户设备与基站之间。  When the inner area of ​​the user equipment in a radio coverage by a base station, over a radio link associated with the communication can be established between the user equipment and the base station. 每个基站通常支持在服务的地理区域内的多个扇区。 Each base station typically supports a plurality of sectors within a geographical area. 网络内的无线电覆盖在一些情况中可能是不可靠的，这可能导致在用户设备之间建立通信的困难。  the radio network coverage in some cases may not be reliable, which may lead to difficulty in establishing communication between user equipment. 第一方面提供了一种在无线通信网络内的被配置为经由直接无线电链路与其他用户设备进行通信的用户设备之间建立关联的方法，该方法包括：在被配置为经由直接无线电链路进行通信的用户设备中的一个用户设备处，监测对来自其他用户设备中的一个用户设备的信标信号的接收；如果接收到这样的信标信号，则向发射所接收的信标信号的用户设备通告对该信标信号的接收，来与发射所接收的信标信号的用户设备建立关联；以及如果没有接收到信标信号，则开始发射信标信号并且监测对所发射的信标信号已经被其他用户设备中的一个用户设备接收到的通告的接收，来与负责发射该通告的其他用户设备建立关耳关。  The first aspect is provided a method in a wireless communication network configured to establish the association between user devices communicate directly via a radio link with other user equipment, the method comprising: via direct configured a radio link for a user device in communication with a user equipment, monitoring reception of a beacon signal from another user device in the user equipment; if such a received beacon signal, then the received beacon to transmit the user equipment receives the announcement signal is a beacon signal, to associate with the user equipment transmitting the beacon signal received; and if not received the beacon signal, the beacon signal begins transmitting on the channel and monitoring the transmitted received beacon signal has been received by a user equipment advertised to other user equipment, the user equipment to transmit another announcement responsible for the establishment and shut off the ear. 该第一方面认识到无线电信网络内的用户设备可操作为发射和接收设备，并且尽管通过无线电链路的通信可能由网络和相关联的核心架构利用集中化的决定做出过程而最有效地加以监视，但是可能存在对于用户设备而言可操作使得它们能够经由直接无线电链路进行通信可能是有利的场合。  The first aspect recognizes that the user equipment within a wireless telecommunications network is operable to make the process of transmitting and receiving apparatus, and determines the possibility of using a centralized although communication by the radio link and the core network infrastructure and associated most efficiently be monitored, but there may be such that they are operable to communicate via a case may be advantageous to direct radio link for the user equipment. 如果被配置为进行操作来与其他类似被配置的用户设备进行通信，将有必要以高效且最低破坏性的方式来建立通向在一个区域中进行操作的其他用户设备的这种直接通信链路。 If configured to operate to communicate with other user devices are configured similarly, it will be necessary in an efficient and least disruptive way to build such a direct communication link to other user equipments operating in a leading region . 该第一方面提供了一种方法，根据该方法，在一个区域中并不是所有用户设备都必然需要操作为发射信标以向该区域中的其他用户设备通知它们的存在。 The first aspect provides a method, according to which, in an area not all devices necessarily requires the user to inform them of the presence of operation to emit a beacon to the other user equipment in the area. 通过在发射它们自己的信标之前监测对信标的接收，用户设备可以减小在一个地区中引起的干扰，并且可以例如确保节约它自己的电池寿命。 By monitoring the reception of the beacon before transmitting their own beacon, the user equipment may reduce interference caused in a region, and may be, for example, to ensure that its own save battery life. 可操作为执行根据该第一方面的方法的用户设备可以自主地形成全部被配置为进行操作以建立直接无线电通信链路的用户设备的群集或者集群。  The user equipment is operable to perform the method according to the first aspect may form the entire cluster or clusters are configured to operate to establish a direct radio communication link of the user equipment autonomously. 将意识到，这种集群的大小可能被用户设备正在发射的信标信号的发射强度所限制。 It will be appreciated that the cluster size may be limited by the emission intensity of a beacon signal being transmitted to the user equipment. 如果信标信号没有强到足以被另一用户设备成功地接收到，则怀着与另一用户建立直接通信链路的希望，该用户它自己将开始发射信标信号。 If a beacon signal is not strong enough to be successfully received by another user equipment, the establishment of the desired With direct communication link with another user, the user will begin to transmit its own beacon signal. 在一个实施例中，该关联包括在接收到信标信号的所述用户设备与发射所述信标信号的所述用户设备之间建立直接无线电链路。  In one embodiment, the association comprises establishing a direct radio link between the received beacon signal from the user equipment and the user equipment transmits the beacon signal. 该直接无线电链路可以例如包括连续的无线电链路，意味着消息收发不断地在这两个相关联的用户设备之间传递，或者可以例如包括不连续的无线电链路。 The direct radio link may comprise, for example, a continuous radio link, it means constantly messaging between a user equipment associated with these two transfer, for example, or may comprise a discontinuous radio link. 例如，在一些方面和实施例中，信标持有者可以操作为根据所选择的不连续发射和/或接收（DTX和DRX)周期D 1来发射主信标。 For example, in some aspects and embodiments, the beacon holder may operate according to a selected embodiment of the discontinuous transmission and / or reception (DTX and DRX) cycle D 1 to transmit a master beacon. 在组内不是信标持有者(即，它没有正发射信标信号）的用户设备可以操作为发射次信标，该次信标由信标持有者所辨识。 In the group holders than the beacon (i.e., it is not being transmitted beacon signal) may operate a user equipment to transmit a beacon times, the sub-beacon by the beacon identification holder. 在一个组内能够使用多于一个次信标。 Within a group can be used more than once a beacon. 可以利用所选择的DRX周期D 2以较低速率来发射次信标，其中D2M1。 Can be selected using the DRX cycle at a lower rate D 2 beacon transmit times, wherein D2M1. 这样的次信标可以由信标持有者用来确定是维持还是丢弃已有D2D组内的非信标持有者用户设备。 Such secondary beacon may be used by the beacon is determined to maintain the holder or discard non-beacon holder D2D user equipment in an existing group. 使用不连续发射或接收周期来发射信标可以帮助节约可操作为发射信标的用户设备的电池寿命。 Using discontinuous transmission or reception cycle to transmit a beacon can help save operable to emit beacon user equipment battery life. 在一个实施例中，关联包括由发射所述信标信号的所述用户设备维护的用户设备集群列表的成员资格，所述集群列表包括发射所述信标信号的所述用户设备与之具有直接无线电链路的用户设备的列表。  In one embodiment the user equipment, the association comprises the cluster membership list maintained by the user equipment to the user equipment transmits the beacon signal, said cluster list comprising transmitting the beacon signal and list of user equipment having a direct radio link. 因此，用户设备一经发现发射信标信号的用户设备就可以实质上发现信标信号持有用户与之具有关联的所有其他用户设备的存在。 Thus, a user device via user equipment transmits discovery beacon signal can be held substantially discovery beacon signal the presence of all other users with whom the user has an associated devices. 因此，对于一个用户而言可能不需要自主地维持与一个地区中的所有其他用户设备的直接链路，因为信标持有者可以操作为指令它已经与之关联的用户设备来创建它们之间的直接链路，或者充当用于在经由发射信标信号的用户而被关联的两个用户之间的直接通信的中继。 Thus, a user may not need to autonomously maintain all direct link with a region other user equipment, because the user may operate the beacon holder device has associated with it an instruction to create between them direct link, or the relay serves as a direct communication between two users via the user transmits a beacon signal is associated to. 类似地，发射信标信号的用户可以维护集群列表，从而它能够在如下的网络内操作为关键或控制节点，在该网络中，用户装置已经被配置为在设备到设备通信模式中进行操作。 Similarly, the user transmits a beacon signal may maintain a list of clusters, so that it can operate as a key or control nodes within the following network, in the network, the user device has been configured to operate in the device-to-device communication mode. 在一个实施例中，集群列表进一步包括与集群内的用户设备有关的信息。  In one embodiment, the cluster list further includes information relating to the user equipment within the cluster. 这样的信息可以例如包括：UE ID、UE路径损耗、以及其他类似的参数。 Such information may include, for example: UE ID, UE a path loss, and other similar parameters. 在一个实施例中，该方法进一步包括：交换在接收到信标信号的用户设备与发射该信标信号的用户设备之间所建立的直接无线电链路的无线电条件的指示符。  In one embodiment, the method further comprising: indicator switching radio conditions between the received beacon signal, the user equipment and the user equipment transmits the beacon signal to establish the direct radio link. 因此，通过监测或者评估与所建立的直接无线电链路有关的信息，对于用户设备而言有可能执行与维护两个用户设备之间的关联有关的进一步动作。 Thus, by monitoring or evaluating information relating to the direct radio link established, it is possible for the user equipment performs a further operation and maintenance-related association between the two user equipment. 该交换可以包括：非信标用户向发射信标信号的用户设备发射路径损耗的指示符。 This exchange may include: non-beacon user an indicator to the user equipment loss transmission path transmitting the beacon signal. 该交换可以包括：发射信标信号的用户设备接收由非信标用户所经历的路径损耗的指示符。 The exchange may comprise: transmitting an indicator to the user equipment the beacon signal received by the path loss non-beacon experienced by the user. 在一个实施例中，该方法进一步包括：确定无线电条件的指示符是否没有满足链路维持准则，并且如果没有，则终止在接收到信标信号的用户设备与发射该信标信号的用户设备之间的所建立的关联。  In one embodiment, the method further comprising: determining whether the indicator does not satisfy the conditions of radio link maintenance criteria, and if not, terminates the beacon signal in the received beacon signal and transmitting the user equipment association established between the user equipment. 关联的终止可能致使用户设备不能接收到信标信号。 Associated termination may cause the user equipment can not receive the beacon signal. 这样的非信标信号用户可以然后可操作为开始发射信标信号并且建立能够进行设备到设备通信的用户设备的新集合或集群。 Such a non-beacon signal from the user may then be operable to transmit a beacon signal and starts to establish a new device can be set to a user device or a cluster of communication devices. 在一个实施例中，该方法进一步包括：确定无线电条件的指示符是否没有满足链路维持准则，并且如果没有，则确定用户设备正在以指示到达信标信号覆盖的边缘的强度从所述其他用户设备之一接收所述信标信号，并且开始发射信标信号。  In one embodiment, the method further comprising: determining whether the indicator does not satisfy the conditions of radio link maintenance criteria, and if not, determining that the user equipment is indicative of arrival at the edge strength of the beacon signal from the cover receiving the beacon signal of said one of the other user equipment, and starts transmitting a beacon signal. 在一个实施例中，发射信标信号的用户设备可以指令它与之具有关联的用户设备开始发射信标信号。  In one embodiment, the user equipment transmits a beacon signal may instruct the user equipment with which it begins transmitting a beacon signal having associated with it. 因此，电池电源耗尽或者希望退出设备到设备通信模式的信标持有者确保了设备到设备功能可以高效地维持在网络的一个地区内。 Thus, battery power is depleted or if you want to exit the device-to-device communication mode beacon holder device functions to ensure that the equipment can be efficiently maintained within a network area. 在一个实施例中，在由发射所述信标信号的所述用户设备维护的集群列表内的被配置为经由直接无线电链路与其他用户设备进行通信的用户设备之间的直接无线电链路通信，经由发射所述信标信号的所述用户设备，在所述集群列表内的用户设备之间被路由。  In one embodiment, the cluster within the list maintained by the user equipment to transmit the beacon signal is configured to communicate between the user equipment via a direct radio link to other user devices direct radio link communication, via the user device transmitting the beacon signal, is routed between the user equipment within the cluster list. 因此，发射信标信号的用户设备可以与它的集群列表中的每个用户设备维持直接链路，并且集群列表内的用户设备可以经由通过信标持有者加以中继的消息来联系彼此。 Accordingly, the user equipment transmits a beacon signal may be maintained with a direct link to each user device in its list of clusters, and the user equipment within the cluster list may be linked to each other via a message to be relayed through the beacon holder. 在一个实施例中，对关联的建立包括：请求与发射所述信标信号的所述用户设备建立直接无线电链路，并且等待对建立请求的所述直接无线电链路的确认。  In one embodiment, the establishment of the association comprises: requesting the user equipment to transmit said beacon signal to establish a direct radio link, and waits for confirmation of the direct radio link setup request. 因此，直接链路可以建立在信标信号发射用户设备与非信标信号发射用户之间。 Thus, the direct link can be established between the user equipment transmitting the beacon signal and the non-transmitting user beacon signal. 通过请求关联，如果没有满足适当的关联准则，则信标信号发射用户可以能够拒绝创建关联，例如，用户可能已经具有满的集群列表，所报告的可能直接链路的强度可能不足够强，用户可能不具有适当的用户类型，以及其他类似的建立准则。 By requesting association, if there is no proper correlation criteria satisfied, the user may transmit a beacon signal to reject create an association, for example, a user may already have a full list of clusters, the strength may be reported to the direct link may be strong enough, the user It may not have the proper user type, and other similar established guidelines. 在一个实施例中，对关联的建立包括：接收对于与发射所述信标信号的用户设备建立直接无线电链路的请求，并且如果满足集群或建立准则，则发射对建立所请求的直接无线电链路的确认。  In one embodiment, the establishment of the association comprises: receiving a request for establishing a direct radio link to the user equipment transmits the beacon signal, and if so establishing a cluster or criteria, then transmit the request for the establishment of direct radio link confirmation. 在一个实施例中，该请求包括在接收用户设备处的所接收的信标信号的强度的指示。  In one embodiment, the request includes an indication of the intensity of the beacon signals received at the user equipment received. 这种对强度的指示可以例如包括对所经历的路径损耗的指示。 Such an indication may for example comprise an indication of the strength of the path loss experienced. 在一个实施例中，对关联的建立包括：从发射信标信号的用户设备接收与被包括在集群列表中的用户设备有关的信息。  In one embodiment, the establishment of the association comprising: transmitting user device receives from the beacon signal includes information relating to the user equipment in the cluster list. 因此，建立新关联的用户可以接收与已经和发射信标信号的用户具有关联的所有用户设备有关的信息。 Thus, the user can create a new association information relating to the receiving user equipment has all users and transmit a beacon signal having associated with it. 在一个实施例中，每次新的关联由发射信标信号的用户做出或者终止，发射信标信号的用户可以采取步骤来向集群列表中的那些其他用户设备发射经更新的集群列表的指示。 In one embodiment, each new association made or terminated by the user transmits a beacon signal, the user may transmit a beacon signal indicated by take steps to update the list of other user equipment transmit cluster to the cluster list of those . 在一个实施例中，该方法进一步包括：发射与由发射所述信标信号的用户设备包括在所述集群列表中的用户设备有关的信息。 In one embodiment, the method further comprising: transmitting information related to a user equipment in the cluster list, by transmitting the beacon signal comprises a user equipment. 在一个实施例中，监测对来自其他设备中的一个设备的信标信号的接收包括：监测来自其他设备中的一个设备的不连续信标信号。  In one embodiment, the monitoring of the beacon signal received from a device other device comprises: monitoring a discontinuous beacon signal from a device to other devices. 因此，将意识到，可以连续地或者不连续地发射信标信号。 Thus, it will be appreciated, it may be continuously or discontinuously transmits a beacon signal. 不连续发射可以导致电源节省。 Discontinuous transmission may result in power savings. 此外，在一个实施例中，开始发射信标信号包括：开始发射不连续信标信号。 Further, in one embodiment, it begins transmitting the beacon signal comprises: transmitting the start discontinuous beacon signal. 在一个实施例中，监测对来自其他设备中的一个设备的信标信号的接收包括：监测来自其他设备中的一个设备的包括所选择的用户类型签名的信标信号。  In one embodiment, monitoring and receiving a beacon signal from the other devices, comprising: monitoring a beacon signal including the selected signature type of the user from a device to other devices. 在一个实施例中，开始发射信标信号包括：开始发射包括所选择的用户类型签名的信标信号。 In one embodiment, it begins transmitting the beacon signal comprises: a beacon signal the start of the selected type of the user comprises transmitting the signature. 多个方面和多个实施例可以允许对信标内的签名进行编码，以识别将被指示的D2D用户的"类型"或者D2D用户设备要求的服务类型。 The various aspects and embodiments may allow a plurality of signatures in the beacon coded to identify the type of service "type" of the user is instructed D2D D2D user equipment or required. 每种类型的能够进行D2D的用户设备可以因此在发射信标时使用签名集合中的一个或多个签名。 Each type of user device capable of D2D signature set may thus use one or more signatures when transmitting a beacon. 在紧急情况中需要来自公共安全警察的帮助的能够进行D2D的用户设备可以操作为在它的信标内广播适当的签名。 In an emergency situation need help from the public security police of the user equipment to the D2D may operate within its beacon broadcast appropriate signature. 在一些实施方式中，不属于公共安全警察的用户设备不可操作为搜索公共安全签名，并且因此将不可操作为与发射这种签名的设备建立不必要的无线电链路。 In some embodiments, the police do not belong to the public safety user equipment is not operable to search for the signature public safety, and thus will not be operable to establish with such devices emitting radio link signature unnecessary. 类似地，不属于公共安全警察的用户设备可以操作为监测信标中的适当签名的存在，并且仅与发射这种适当签名的用户设备建立D2D无线电链路。 Similarly, the police do not belong to public safety user equipment may be operable to monitor the presence of a suitable signature of the beacon, and only establishing a radio link with the user equipment D2D transmitting such suitable signature. 根据一些实施例，一个或多个D2D信标签名可以被指配给一种类型的用户设备或者服务级别，并且那些信标签名组合可以由用户设备用来在服务的级别或者用户设备的类型之间进行区分。  According to some embodiments, the one or more channels D2D name tags may be assigned to one type of user equipment or a service level, and the letters may be used in combination tag name service level or user equipment by the user equipment distinguish between types. 在一个实施例中，信标信号包括等级的指示，并且在用户设备处接收到多于一个信标信号的情况中，该方法进一步包括：评估与信标信号相关联的等级的指示，并且向发射被评估为具有最高等级的所接收的信标信号的用户设备通告接收到该信标信号，来与发射具有最高等级的所接收的信标信号的用户设备建立关联。  In one embodiment, the beacon signal includes an indication level, and receives the case of more than one beacon signal at a user equipment, the method further comprising: indicating the assessment and rating of the beacon signal associated and evaluated for the user equipment to transmit the received announcement beacon signal received with the highest level of the beacon signal to the user equipment associated with the received beacon signal with the highest level of emission. 根据一些实施方式，例如，高等级的警察可以被配置为进行操作使得适当的信标签名被选取来识别用户等级，并且能够进行D2D的用户设备可以操作使得高等级的用户设备充当对于属于具有适当信标签名的公共安全组的一组用户设备而言的主要接触点。  According to some embodiments, e.g., a high level of the police may be configured to operate such that the appropriate channel is selected name tag to identify the user level, and can be operated D2D user equipment can act as such a high level for a user equipment the main contact point in terms of a set of user equipment belongs to the group having an appropriate public safety letter of the name tag. 信标签名组合可以提供一种机制，该机制用于高等级警察在D2D组内承担信标角色并且允许其他"较低"等级的已有信标优先于这种高等级信标被移除。 Beacon signature combination may provide a mechanism, the mechanism for high-level police assume a beacon role within the group and allow existing D2D Beacon other "lower" grade level take precedence over this beacon is removed. 在一个实施例中，一个组内的所有信标签名可以具有共同的共性（denominator)。  In one embodiment, all channels within a tag name can have a common set of common (denominator). 例如，信标签名的第一部分可以是共同的并且剩余部分可能跨越一个组而不同，并且被用来识别在该组内进行操作的用户设备的"级别"。 For example, a first portion of the letter may be common tag name and the remaining portion may span a different group, and is used to identify the "level" of the user equipment operating in the group. 用户设备可以因此可操作为仅关于共同部分来执行初始搜索，以便于能够辨识适当的组信标。 Thus user equipment may be operable to only be performed on a common portion of the initial search, in order to identify the appropriate group can be a beacon. 一旦用户设备已经基于检测到适当的共同签名而识别了一个组，它就对该信标签名执行进一步的信标解码，以确定广播这种信标的用户设备的级别。 Once the user equipment has identified a suitable group based on the detected common signature, it performs further decoding the beacon beacon signature, to determine the level of such a beacon broadcast of the user equipment. 第二方面提供了一种计算机程序产品，当在计算机上执行时可操作为执行该第一方面的方法。  A second aspect provides a computer program product operable to perform the method of the first aspect, when executed on a computer. 第三方面提供了一种可操作为与在无线通信网络内的被配置为经由直接无线电链路与其他用户设备进行通信的其他用户设备建立关联的用户设备，该用户设备包括：监测逻辑，被配置为监测对来自其他用户设备的信标信号的接收；通告逻辑，被配置为如果接收到这样的信标信号，则向发射所接收的信标信号的其他用户设备通告接收到该信标信号，来与发射所接收的信标信号的用户设备建立关联；以及发射和接收逻辑，被配置为如果没有接收到信标信号，则开始发射信标信号并且监测对所发射的信标信号已经被其他用户设备接收到的通告的接收，来与负责发射该通告的其他用户设备建立关联。  A third aspect provides a method to be operable to associate other user equipment via a direct radio link to communicate with other user equipment is arranged within a wireless communication network user equipment, the user equipment comprising: monitoring logic configured to monitor reception of the beacon signal from another user device; advertisement logic configured for such a beacon if the received signal, the other user equipment announcement beacon signal received by the transmitting and receiving to the beacon signal to the user equipment the beacon signal and transmitting the received association; and transmitting and receiving logic is configured to, if not received the beacon signal, then begins transmitting the beacon signals and monitor the beacon of the transmitted signal has been received by the other user equipment receives the advertisement, the other user equipment to transmit the announcement associated with the responsible. 在一个实施例中，该关联包括在接收到信标信号的用户设备与发射该信标信号的用户设备之间建立直接无线电链路。  In one embodiment, the association comprises establishing a direct radio link between the received beacon signal, the user equipment and the user equipment transmits the beacon signal. 在一个实施例中，该关联包括由发射该信标信号的用户设备维护的用户设备集群列表的成员资格，该集群列表包括发射该信标信号的用户设备与之具有直接无线电链路的用户设备的列表。  In one embodiment, the association comprises the cluster membership list maintained by the user equipment the user equipment transmits the beacon signal, which includes a list of clusters transmits the beacon signal with a user equipment having a direct radio link the list of user equipment. 在一个实施例中，该用户设备包括：无线电条件逻辑，可操作为交换在接收到信标信号的用户设备与发射信标信号的用户设备之间所建立的直接无线电链路的无线电条件的指示符。  In one embodiment, the user equipment comprising: a radio condition logic operable to direct radio link between the exchange receives a beacon signal, the user equipment and the user equipment transmits a beacon signal of the established radio indicator conditions. 在一个实施例中，如果发射逻辑从发射信标信号的用户设备接收到开始发射它自己的信标信号的指令，则它可操作为开始发射信标信号并且监测对所发射的信标信号已经被其他用户设备接收到的通告的接收，来与负责发射该通告的其他用户设备建立关联。  In one embodiment, if the instruction issue logic begins to transmit its own user beacon signal from a receiving device to transmit a beacon signal, it is operable to begin transmitting beacon signals and transmitted to the monitoring channels beacon signal has been received by the other user equipment receives the advertisement to be associated with other user equipment is responsible for transmitting the advertisement. 在一个实施例中，该用户设备包括：确定逻辑，可操作为确定所接收的无线电条件的指示符是否满足链路维持准则，并且如果没有，则终止在接收到信标信号的用户设备与发射信标信号的用户设备之间的所建立的关联。  In one embodiment, the user equipment comprising: determination logic operable to determine a condition of the received radio indicator meets the link criterion is maintained, and if not, terminates the user receiving the beacon signal correlation established between the transmitting device and the user equipment the beacon signal. 在一个实施例中，该用户设备包括：通信逻辑，可操作为经由它自己与由发射信标信号的用户设备维护的集群列表内的用户设备之间的直接无线电链路通信来路由集群列表内的用户设备之间的通信。  In one embodiment, the user equipment comprising: communication logic operable to direct communication via a radio link between itself and the user equipment in the cluster list maintained by the user equipment transmits a beacon signal to route communication between the user equipment within the cluster list. 在一个实施例中，该用户设备包括：建立逻辑，可操作为通过请求与发射信标信号的用户设备建立直接无线电链路并且等待对建立所请求的直接无线电链路的确认来建立关联。  In one embodiment, the user equipment comprising: establishing logic operable to establish a direct radio link a request by the user equipment transmits a beacon signal and waiting for an acknowledgment of the establishment of a direct radio link is established the requested association. 在一个实施例中，该用户设备包括：建立逻辑，可操作为接收对于建立直接无线电链路的请求，并且如果满足集群准则，则发射对建立所请求的直接无线电链路的确认。  In one embodiment, the user equipment comprising: establishing logic operable to receive a request for establishing a direct radio link, and if the cluster criteria are satisfied, then the confirmation of the establishment of the requested direct radio transmission link. 在一个实施例中，该请求包括在接收用户设备处所接收的信标信号的强度的指不。  In one embodiment, the request includes means strength received at the receiving user equipment the beacon signal is not. 在一个实施例中，该建立逻辑可操作为从发射信标信号的用户设备接收与被包括在集群列表中的用户设备有关的信息。  In one embodiment, the logic is operable to establish information relating to the receiving user device transmits a beacon signal and is included in the list of clusters from the user equipment. 在一个实施例中，该建立逻辑可操作为向请求建立关联的用户设备发射与被包括在它的集群列表中的用户设备有关的信息。  In one embodiment, the logic is operable to establish a user equipment to transmit association request information included in its list of clusters in the user equipment. 在一个实施例中，该用户设备包括：监测逻辑，可操作为通过监测来自其他设备中的一个设备的不连续信标信号，来监测对来自其他用户设备中的一个用户设备的信标信号的接收。  In one embodiment, the user equipment comprising: monitoring logic operable to monitor through a discontinuous beacon signal from a device to other devices to monitor for a channel from the user equipment to other user equipment received beacon signal. 在一个实施例中，该发射逻辑可操作为通过开始发射不连续信标信号来开始发射ig标ig号。  In one embodiment, the transmitter begins transmitting logic is operable by a discontinuous beacon signal to begin transmitting ig ig subscript number. 在一个实施例中，该发射逻辑可操作为，如果它确定用户设备正在以指示到达信标信号覆盖的边缘的强度从所述其他用户设备之一接收所述信标信号，则开始发射信标信号。  In one embodiment, the logic is operable to transmit, if it is determined that the user equipment to indicate the strength of the beacon signal reaches the edge of coverage from the reception of the beacon signal of the other one of the user equipment is started transmit a beacon signal. 在一个实施例中，该用户设备包括：控制逻辑，可操作为如果所述用户设备正在发射信标信号，则指配或指令它的集群列表中的成员来发射信标信号。  In one embodiment, the user equipment comprising: a control logic operable if said beacon signal being transmitted user equipment, means or instructions to its members with the cluster list to transmit a beacon signal. 在一个实施例中，该监测逻辑可操作为，通过监测来自其他设备中的一个设备的包括所选择的用户类型签名的信标信号，来监测对来自所述其他设备中的一个设备的信标信号的接收。  In one embodiment, the monitoring logic is operable by a user to monitor the type comprising a signature of the selected beacon signal from a device to other devices, and to monitor a device from the other devices on It received beacon signal. 在一个实施例中，该发射逻辑可操作为开始发射包括所选择的用户类型签名的信标信号。  In one embodiment, the transmit logic operable to transmit a beacon signal including the selected signature for the type of user start. 在一个实施例中，信标信号包括等级的指示，并且在用户设备处接收到多于一个信标信号的情况中，该控制逻辑可操作为评估与信标信号相关联的等级的指示，并且向发射被评估为具有最高等级的所接收的信标信号的用户设备通告接收到信标信号，来与发射具有最高等级的所接收的信标信号的用户设备建立关联。  In one embodiment, the beacon signal includes an indication of the level, and receives the case of more than one beacon signal at a user equipment, an indication that the control logic is operable to evaluate the level associated with the beacon signal , and evaluated for the user equipment to transmit the received announcement beacon signal received with the highest level of the beacon signal to the user equipment associated with the received beacon signal with the highest level of emission. 进一步的特定和优选的方面在所附独立权利要求和从属权利要求中加以阐述。  Further particular and preferred aspects are set forth in the appended independent claims and the dependent claims. 从属权利要求的特征在适当时可以与独立权利要求的特征进行组合，以及采用除了在权利要求中明确阐述的那些组合以外的组合。 Wherein the dependent claims may be carried out as appropriate with features of the independent claims in combination, and the use of combinations of compositions in addition to those explicitly set forth in the claims. 在装置特征被描述为可操作为提供一种功能的场合，将意识到，这包括提供该功能或者被适配或被配置为提供该功能的装置特征。  In the apparatus described is operable to provide for the case wherein one function, it will be appreciated that this feature or comprising providing the apparatus is adapted or configured to provide the characteristic feature. 图4示意性地图示了根据一个实施例的可能的设备到设备级别用户操作。  FIG 4 schematically illustrates a device level to a user operation according to a possible embodiment of the device according to one embodiment. 通常，基站内的不同天线支持每个相关联的扇区。  Generally, different antennas in the base station associated with each supporting sector. 每个基站具有多个天线。 Each base station has a plurality of antennas. 将意识到，可以实施不同的网络架构，包括：例如，UMTS系统、WiMX系统、或者长期演进（LTE)系统。 It will be appreciated, may be implemented in different network architecture, comprising: for example, UMTS system, WiMX system, or a long term evolution (LTE) system. 一般而言，跨越这些架构，由上面所描述的网络节点提供的功能由被不同地命名但是具有类似功能的网络节点来提供。 In general, these span architecture, provided by the network nodes described above functions are provided by a network node named differently, but having a similar function. 已经认识到，可能存在基站不能在一个地理地区中供应无线电覆盖的场景，以及可能期望在网络中的用户之间提供通信。  It has been recognized there may be a base station radio coverage scene can not be supplied in a geographic region, and it may be desirable to provide communication between users in the network. 在这样的场景中，可能有可能实施设备到设备(D2D)通信。 In such a scenario, it may be possible embodiment of the device-to-device (D2D) communication. 在D2D模式中，用户设备（UE)可以操作为彼此建立直接无线电链路用于通信。 In D2D mode, the user equipment (UE) may operate to establish a direct radio link to communicate with each other. 因为用户设备是相对低电源的发射和接收设备，所以直接无线电通信可能依赖于在彼此的范围内的用户设备。 Because the user equipment are transmitting and receiving apparatus of relatively low power, so the direct radio communication may be dependent on user equipment within range of each other. 相比于跨越短距离使用无线网络架构解决方案，D2D通信链路可以提供用户装置之间的通信延迟上的减小，因为没有经由网络在用户设备之间传递消息的需要。 Compared to a short distance across the wireless network infrastructure using the solution, the D2D communication link may be provided to reduce the communication delay between the user equipment, since there is no need to pass messages between user devices via a network. 此外，如果用户设备被定位使得它们接近在一起，则设备到设备通信技术还可以减小用户设备发射电源，导致对潜在有限的电池电源的节省。 Further, if the user equipment is located such that they are close together, the device-to-device communication technologies may also reduce the power transmitting user equipment, leading to potential savings of limited battery power. 尽管设备到设备通信技术可以提供一些优点，但是它们可能导致不想要的或意外的问题。  Although the device-to-device communications technology may offer some advantages, but they may cause unwanted or unexpected problems. 设备到设备技术的一个方面是一种机制，根据该机制，一个用户设备可操作为发现通信范围内的另一用户设备。 Aspect of a device to device technology is a mechanism in accordance with this mechanism, a user device is operable to discover another user equipment within the communication range. 有可能牵涉到网络内的元件，使得一个用户设备能够向网络提供一个或多个测量，并且网络然后可操作为将由网络确定为在用于通过直接链路的通信的适合范围之内的两个用户设备进行配对。  There may be involved in the network element, such that a user device to provide one or more measurements to the network, and the network determined by the network is then operable as appropriate within a range for communication through a direct link the two user equipments are paired. 在这样的设立过程中牵涉到网络元件可能增加信令开销和延迟两者，因为需要在用户设备与在建立设备到设备直接通信链路中牵涉到的每个网络元件之间发送测量报告和信令消息。  The network element may involve both increases signaling overhead and delay, since the need to send the user equipment and a network element between each device to device to establish a communication link directly involved in the measurement process of establishing such a reports and signaling messages. 还有可能通过允许用户设备发射信标或导频信号并且允许用户设备进行操作使得它们搜索由另一用户设备广播的信标或导频信号，来允许用户设备发现彼此。  It is also possible that they search a beacon or pilot signal broadcast by another user equipment, to allow the user equipment to discover each other by allowing the user equipment transmits a beacon or pilot signal and allows the user to operate the device. 用户设备信标发射的配置是共同的，使得所有的用户设备都知道如何搜索这样的信标。 Configuring user equipment beacon transmissions are common, so that all the user equipment knows how to search for such a beacon. 被分配用以发射这种信标的资源可以由网络来配置。  allocated resources to transmit beacons that may be configured by the network. 这种方法可以支持相比于如果建立这种链路是由网络来组织而言更加快速地建立用户设备之间的直接无线电链路。 This approach can be supported than if the establishment of such links are organized by the network in terms of establishing a direct radio link between the user equipment more quickly. 用户设备信标可能充当对在一个区域中进行操作的其他用户设备的干扰。  The user equipment may serve as a beacon interference to other users in a device operating region. 如果存在许多用户设备在一个区域内进行发射，则由每个用户设备信标引起的结果干扰可能引起用户设备信标基本上是不可解码的。 If the result of many interfering user equipment to transmit the presence in an area, by each user equipment may cause the beacon due to the user equipment the beacon is substantially undecodable. 上面所描述的两种方法为了安全目的可能要求与网络的通信。  Both methods described above for security purposes may require communication with the network. 当然，有可能采用混合的方法，使得网络被牵涉并且要求由用户设备对信标的广播。 Of course, possible to use a hybrid approach, such networks are involved and required for the beacon broadcast by the user equipment. 然而，可能存在网络不可用或者用户设备不具有可用的网络覆盖的场景。 However, there may not be available or the user network device does not have network coverage available in a scene. 可以有用地建立设备到设备通信链路，而无需网络元件的援助。 May usefully device to device to establish a communication link, the network element without assistance. 这种场景的一个示例是在网络覆盖可能缺失的灾难地区处的紧急情形。 An example of this scenario is an emergency situation in network coverage may be missing at the disaster area. 在以任何更多细节讨论实施例之前，首先将提供一个概述。  Prior to discussing embodiments in any more detail, it is first to provide an overview. 所描述的方面和实施例可以将一个区域中的能够进行设备到设备通信的用户设备分组在一起。 The described aspects and embodiments may be a region of the device can be grouped together in the user equipment to the communication device. 在这样的一个组内，一个用户设备或者有限数目的用户设备可操作为发射信标。 In such a group, a user device, or a limited number of user equipment is operable to transmit a beacon. 这样的组被称为D2D组，并且在一个组内可操作为发射信标的用户设备被称为信标持有者（holder)。 Such groups are referred to as D2D group, and is operable to emit a beacon group the user equipment is referred to as a beacon holder (holder). 相比于其中接近于彼此定位的许多用户设备自主地开始发射信标而没有对在附近操作的其他用户设备的任何考虑的场景，用以在这样的D2D组中进行操作的用户设备的布置可以帮助减小干扰。 Compared to the arrangement wherein the user equipment is positioned close to each other a number of user equipment begins transmitting the beacon scene autonomously without any consideration of other equipment in the vicinity of the user operation for the group in such a D2D operation may be performed help reduce interference. 多个方面和多个实施例还可以为用户设备提供自动地和/或自主地加入和离开D2D组的灵活性。 The various aspects and embodiments may also be a plurality of user equipment to automatically provide flexibility and / or autonomously D2D join and leave the group. 此外，如果满足改变条件，多个实施例可以允许信标持有者自动地或者自主地加以改变。 Further, if the change condition is satisfied, a plurality of embodiments may allow the holder beacon automatically or be changed autonomously. 根据一些方面和实施例，所指定的信标持有者能够维护包含与该组内的其他用户设备有关的信息的列表。  In accordance with some aspects and embodiments of the list, the specified beacon contains information about the holder can be maintained with other user devices within the group. 这样的信息可以例如包括：UE ID、UE路径损耗、以及其他类似的参数。 Such information may include, for example: UE ID, UE a path loss, and other similar parameters. 根据一些实施方式，用户设备可以属于不同的组或者多于一个组。  According to some embodiments, the user equipment may belong to different groups, or more than one group. 换句话说，组可以交叠。 In other words, groups may overlap. 根据一些方面和实施例，发现信标持有者的用户设备也将实质上"发现"属于该信标持有者的组的所有用户设备。  In accordance with some aspects and embodiments, the user discovery beacon holder device also substantially "found" for all user equipments belonging to the group of beacon holder. 根据一些实施例，一经例如通过使用在直接无线电链路上的用户设备之间的专属消息建立了初始的D2D关联，由信标持有者维护的列表就能够从该信标持有者传递给新的组成员。 According to some embodiments, by using a dedicated message via, for example between a user equipment on the direct radio link established D2D initial association, the beacon can be transmitted by the holder maintained list from the beacon to the holder the new group members. 如下面更详细地描述的，各种技术和方法可以被用来管理和维护网络内的D2D 组。  As described in more detail below, various techniques and methods may be used to manage and maintain D2D groups within the network. 根据一个实施例，已经被配置为在设备到设备模式中进行操作并且不属于任何信标组的用户设备可操作为监测可能的信标持有者。  According to one embodiment, it has been configured to operate in the device to device mode and the user equipment does not belong to any beacon group may be operable to monitor beacon holder. 如果在监测时段T bh之后没有接收到信标或导频，则这样的用户设备可以操作为开始发射信标。 If not received after the monitoring period T bh beacon or pilot, then such user equipment may transmit a beacon as the start operation. 换句话说，该用户设备成为对于新D2D组而言的信标持有者。 In other words, the user equipment becomes a beacon for the new holder D2D group. 在一些实施例中，用户设备可以操作为使得：如果在一个组内的非信标持有者与信标持有者之间的所确定的路径损耗超过预定义的触发阈值，则该非信标持有者能够成为另一信标持有者。  In some embodiments, the user device may be operated so that: if the determined between the groups in a non-beacon holders and holders beacon path loss exceeds a predefined triggering threshold, the non-beacon of another beacon holder to be holders. 这样的操作认识到，不是一个D2D组的成员的用户设备可能只是不在对于该组而言的信标持有者的范围内，但是它可能在该组的非信标持有者的范围内。 Recognizing this operation, not a member of a group of user equipment may D2D not only for the group in terms of the range of the beacon holder, but it is possible within the scope of the non-beacon group holders. 根据一些实施例，信标持有者可以属于另一信标持有者的组。  According to some embodiments, the beacon holder may belong to another Beacon Group holder. 在一些实施例中，每个信标持有者能够将成员接受到它的组中。 In some embodiments, each beacon holder to receive the members of its group. 这样的操作能够允许形成交叠的D2D组。 Such operations allow overlapping groups formed D2D. 也就是说，用户设备可以属于多于一个D2D组。 That is, the user can belong to more than one group D2D. 根据一些实施例，信标持有者可以操作为将它的组中的另一成员指配或指令为信标持有者。  According to some embodiments, the beacon holder can operate as another member of its group assignment instruction beacon or holders. 这样的操作可以允许信标持有者放弃它作为信标持有者的位置。 Such operation may permit the holder to give it up as the beacon position beacon holder. 例如，如果用户设备希望退出D2D操作并且退出所建立的D2D组，则这样的操作可以是有用的。 For example, if a user wishes to withdraw the device operation and exit D2D D2D established group, then such an operation may be useful. 图1示意性地图示了根据一个实施例的被配置为在设备到设备通信模式中进行操作的用户设备。  Figure 1 schematically illustrates a user equipment operating in a device-to-device communication mode in one embodiment is configured to calculate. 在图1中所示出的示例中，UEl是对于一个D2D组而言的信标持有者并且发射信标，该信标能够由跨越所示出的阴影覆盖地区的其他用户设备检测到。 In the example shown in FIG. 1, a D2D group UEL for purposes of transmitting a beacon and a beacon holder, the beacon can be shown by the shaded cover other user equipment across the area detected. UE2和UE3 位于该覆盖地区内并且因此属于具有UEl作为信标持有者的该D2D组。 UE2 and UE3 located within the coverage area and therefore belonging to the group having UEl as D2D beacon holder. UE4位于所示出的覆盖地区的外部并且不是具有UEl作为信标持有者的该D2D组的成员。 UE4 located outside the coverage area and is not shown as a member having a UEl the holder D2D beacon group. 图2示意性地图示了根据一个实施例的被配置为在设备到设备通信模式中进行操作的用户设备。  FIG. 2 schematically illustrates a user equipment operating in a device-to-device communication mode in one embodiment is configured to calculate. 在图2中所示出的示例中，UEl是对于一个D2D组而言的信标持有者并且发射信标，该信标能够由跨越所示出的阴影覆盖地区的其他用户设备检测到。 In the example shown in FIG. 2, D2D UEL for a beacon group in terms of the holder and transmitting a beacon, the beacon can be shown by the shaded cover other user equipment across the area detected. UE2和UE3位于该覆盖地区内并且因此属于具有UEl作为信标持有者的该D2D组。 UE2 and UE3 located within the coverage area and therefore belonging to the group having UEl as D2D beacon holder. UE4位于所示出的覆盖地区的外部并且不是具有UEl作为信标持有者的该D2D组的成员。 UE4 located outside the coverage area and is not shown as a member having a UEl the holder D2D beacon group. UE2定位在由UEl的信标所提供的覆盖地区的边缘。 UE2 locate the edge areas covered by the beacon in the UEl provided. UE4在这个D2D组的外部并且因为它不能检测到来自UEl 的信标，所以它不能发现UE2,即便UE2在UE4通信范围内。 D2D UE4 outside this group and because it can not detect a beacon from UEl, UE2 can not find it, even though UE4 UE2 within communication range. 通过允许在覆盖地区的边缘的用户设备发射信标，例如图2中的UE2,在已有D2D组的外部但是不在已有信标持有者的范围内的用户设备能够发现该已有D2D组内的用户设备。 By allowing the edge of the coverage area of ​​the user equipment transmits a beacon, for example, in FIG. 2 UE2, outside the existing D2D group but not within the scope of existing user equipment the beacon holder can be found that the group has D2D user equipment within. 图2图示了已经由UEl指令为发射信标的UE2所支持的覆盖地区，由此允许UE4检测到UE2并且加入D2D组。 Figure 2 illustrates an already supported by the UEl instruction beacon UE2 transmit coverage areas, thereby allowing detection of the UE2 and UE4 added D2D group. 将意识到，在一些实施方式中，没有能够接收到由UEl发射的信标信号，UE4可操作为发射信标。  It will be appreciated that in some embodiments, not be able to receive the beacon signal transmitted by the UEl, the UE4 is operable to emit a beacon. 在这样的实施方式中，UE2可以然后成为由UEl所拥有的D2D组以及由UE4 所拥有的D2D的成员。 In such an embodiment, UE2 can then be owned by the UEl D2D D2D group members and owned by UE4. 如果被配置为在D2D模式中进行操作的用户设备经由接收到适当信标信号而发现了信标持有者，则根据多个实施例，它可以操作为与作为信标持有者进行操作的用户设备建立通信。  If the user equipment is configured to operate in a mode D2D received via appropriate beacon signal beacon holder found, according to various embodiments is, it may operate as a beacon to the holder the user equipment operates to establish communication. 已经发现了信标持有者的用户设备根据多个实施例可以请求加入由该信标持有者所支持的D2D组，并且如果这样的请求被该信标持有者接受，则该用户设备可以操作为向该信标持有者传递所选择的信息。 It has been found beacon holder D2D user equipment may request the beacon group joined by holder supports a plurality of embodiments according to the embodiment, and if such a request is accepted, the beacon holder, the user equipment It may operate as information to beacon transmission of the selected holder. 多个方面和多个实施例的实施方式可以是这样的：信标持有者可能具有在一个组内的用户设备的最大数目，并且因此如果已经达到了组成员的该最大数目，则它可以操作为拒绝加入该组的请求。  Various aspects and embodiments of the embodiment a plurality of embodiments may be such that: the holder may be a beacon device having the largest number of users in a group, and thus has been reached if the maximum number of group members, it may operate to reject a request to join the group. 如先前所描述的，一经检测到从被配置为在D2D模式中进行操作的另一用户设备接收到信标信号，已有的信标持有者就可以操作为加入其他的D2D组。  As previously described, a detected from the another user device is configured to operate in a mode D2D received beacon signal, the beacon existing holders can be operated to add other groups D2D . 根据一些实施例，一个组内的非信标持有者可以持续地监测由（多个）信标持有者发射的信标。  According to some embodiments, non-beacon holder within a group can be monitored continuously emitted by the (s) holder beacon beacon. 如果由一个组成员接收到的信标的质量下降到低于所选择的通信质量阈值，则该非信标持有者可以通知相关的信标持有者。 If the beacon received by the members of a group communication quality falls below a quality threshold selected, then the non-beacon holders notify beacon holder. 该信标持有者可以操作为然后从它的组中移除该非信标持有者。 The holder may operate as a beacon and remove the holder from its non-beacon group. 在一些方面和实施例中，信标持有者可以操作为根据所选择的不连续发射和/或接收（DTX和DRX)周期D 1来发射主信标。  In some aspects and embodiments, the beacon holder may operate according to a selected embodiment of the discontinuous transmission and / or reception (DTX and DRX) cycle D 1 to transmit a master beacon. 组内的不是信标持有者的用户设备可以操作为发射次信标，该次信标由信标持有者加以辨识。 Group is not in the user equipment the beacon holder may be operable to transmit beacon times, the times to be the beacon by the beacon identification holder. 在一个组内能够使用多于一个次信标。 Within a group can be used more than once a beacon. 可以利用所选择的DRX周期D 2以较低速率来发射次信标，其中D2M1。 Can be selected using the DRX cycle at a lower rate D 2 beacon transmit times, wherein D2M1. 这样的次信标可以由信标持有者用来确定是维持还是丢弃已有D2D组内的非信标持有者用户设备。 Such secondary beacon may be used by the beacon is determined to maintain the holder or discard non-beacon holder D2D user equipment in an existing group. 使用不连续发射或接收周期来发射信标可以帮助节约可操作为发射信标的用户设备的电池寿命。 Using discontinuous transmission or reception cycle to transmit a beacon can help save operable to emit beacon user equipment battery life. 两个能够进行设备到设备的用户设备UEl和UE2在彼此的通信范围内。  The two devices can be performed within the device to the user equipment UEl and UE2 in the communication range of each other. UEl开始在D2D模式中进行操作并且可操作为搜索可能的D2D信标信号。 D2D UEl starts operating in the search mode and is operable as possible D2D beacon signal. 如果UEl在预定时间段内无法找到任何D2D信标，则UEl可操作为发起充当信标持有者并且开始发射信标信号。 If UEl can not find any D2D beacons a predetermined time period, the UEl is operable to initiate a beacon serving as holders and starts transmitting a beacon signal. 如果UE2开始在D2D模式中进行操作，则它可操作为搜索D2D信标信号。  If UE2 starts operating in D2D mode, it is operable to search for beacon signals D2D. 在这个实例中，UE2进行该搜索并且找到UEl。 In this example, UE2 to carry out the search and find UEl. UE2然后可操作为与UEl建立直接无线电链路并且请求加入由UEl所拥有的D2D组。 UE2 is then operable to establish a direct radio link with UEl and request to join the group consisting of UEl D2D owned. 在这个实施例中，UEl接受该请求并且形成了包括UEl和UE2 的D2D 组。 In this embodiment, UEl accepts the request and form the group consisting of D2D UEL and UE2. 所描述的方面和实施例可以允许希望与其他用户设备建立设备到设备链路的用户设备发现彼此，而无需每个都必须发射信标信号。  The described aspects and embodiments may allow the user equipment to the device wishes to establish a link with the other user equipment devices discover each other, without the need to transmit each beacon signal. 如果网络不可用或者如果在一个地理地区中不存在覆盖，则多个方面和多个实施例还可以允许D2D链路被建立。 If the network is not available or if the cover is not present in a geographic region, the various aspects and embodiments may also allow a plurality of D2D link is established. 但是，即使网络是可用的，多个方面和多个实施例也可以被使用。 However, even if the network is available, a plurality of various aspects and embodiments may also be used. 对D2D通信的一种可能使用可以是关于公共安全。  to one D2D communication may be used on public safety. 例如，在紧急情况中，一个警察(officer)可能需要从在他附近的来自相同服务部门（service)或者其他紧急服务部门的其他警察得到帮助。 For example, in an emergency, a police (officer) may need to get help from other police officers from the same service (service) or other emergency service departments near him. 设备到设备通信方法可以在这样的场景中提供有用的服务，特别是在来自基站的覆盖受限制或者不可用的场所。 Device to device communication method may provide a useful service in such a scenario, in particular the cover from the base station is limited or unavailable properties. 然而，如果用户设备D2D信标的格式跨越所有的用户设备是共同的，则一个警察可以检测到不属于其他公共安全警察的D2D用户设备，并且因此D2D链路可能建立在一个警察的用户设备与附近的其他一般的用户设备之间。  However, if the format of the user equipment D2D beacons across all of the user equipment is common to, one police could not detect other public safety police D2D user equipment and thus the user D2D link may be established in a police device and other equipment in general between nearby users. 这种不期望的直接链路浪费了资源并且可能延迟其他警察在紧急情况时的辅助或者到场。 This undesirable directly link a waste of resources and may delay other police assistance in case of emergency or scene. 多个方面和多个实施例可以允许对信标内的签名进行编码，以识别将被指示的D2D用户的"类型"或者D2D用户设备要求的服务类型。  The various aspects and embodiments may allow for multiple signatures within the beacon coded to identify the type of service "type" of the user is instructed D2D D2D user equipment or required. 能够进行D2D的用户设备的每种类型可以因此在发射信标时使用签名集合中的一个或多个签名。 Each type of user device can thus be used for the D2D signature set of one or more signatures when transmitting a beacon. 在紧急情况中要求来自公共安全警察的帮助的能够进行D2D的用户设备，可以操作为在它的信标内广播适当的签名。 Requires assistance from the police public safety in an emergency situation for the D2D user equipment can be operated as in its beacon broadcast appropriate signature. 在一些实施方式中，不属于公共安全警察的用户设备不可操作为搜索公共安全签名，并且因此将不可操作为与发射这种签名的设备建立不必要的无线电链路。 In some embodiments, the police do not belong to the public safety user equipment is not operable to search for the signature public safety, and thus will not be operable to establish with such devices emitting radio link signature unnecessary. 类似地，确实属于公共安全警察的用户设备可以操作为监测信标中的适合签名的存在，并且仅与发射这种适合签名的用户设备建立D2D无线电链路。 Similarly, indeed the public security police user equipment may be operable to monitor the presence of a suitable signature beacon, and only establishing a radio link with the user equipment D2D Such suitable emission signature. 根据一些实施例，一个或多个D2D信标签名可以被指配给一种类型的用户设备或者服务级别，并且那些信标签名组合可以由用户设备用来在服务的级别或者用户设备的类型之间进行区分。  According to some embodiments, the one or more channels D2D name tags may be assigned to one type of user equipment or a service level, and the letters may be used in combination tag name service level or user equipment by the user equipment distinguish between types. 在与上面所略述的发生紧急情况的场景相类似的场景中，很有可能紧急情况的地点将被公共安全人员并且可能被公众成员挤满。 In the scene of an emergency situation outlined above similar scenario is likely to emergency sites will be public safety personnel and members of the public may be crowded. 通过提供不同的签名组合，可以改进在适当的能够进行D2D的用户设备之间的协调。 By providing different signature combination, the coordination between the user equipment can be performed in an appropriate D2D can be improved. 根据一些实施方式，例如，高等级（high ranking)的警察可以被配置为进行操作使得适当的信标签名被选取来识别用户等级，并且能够进行D2D的用户设备可以进行操作使得高等级的用户设备充当对于属于具有适当信标签名的公共安全组的一组用户设备而言的主要联系点。  According to some embodiments, e.g., (high ranking) high level police may be configured to operate such that the appropriate channel is selected name tag to identify the user level, and can be the D2D user equipment may be operated such that a high level the user equipment acts as the primary point of contact for the user equipment belongs to a group of public safety channel group with an appropriate label name is. 信标签名组合可以提供一种机制，该机制用于高等级警察在D2D组内承担信标角色并且允许其他"较低"等级的已有信标优先于这种高等级信标被移除。 Beacon signature combination may provide a mechanism, the mechanism for high-level police assume a beacon role within the group and allow existing D2D Beacon other "lower" grade level take precedence over this beacon is removed. 在一个实施例中，一个组内的所有信标签名可以具有共同的共性（denominator)。  In one embodiment, all channels within a tag name can have a common set of common (denominator). 例如，信标签名的第一部分可以是共同的，并且剩余部分可能跨越一个组而不同并且被用来识别在该组内进行操作的用户设备的"级别"。 For example, a first portion of the beacon signature may be common, and the remainder may span one group and is used to identify different "level" of the user equipment operating in the group. 用户设备可以因此可操作为仅关于共同部分来执行初始搜索，以便于能够辨识适当的组信标。 Thus user equipment may be operable to only be performed on a common portion of the initial search, in order to identify the appropriate group can be a beacon. 一旦用户设备已经基于检测到适当共同签名而识别了一个组，它就对该信标签名执行进一步的信标解码，以确定广播这种信标的用户设备的级别。 Once the user equipment has been identified a group, it performs further decoding the beacon beacon signature, to determine the level of such a broadcast beacon based on the detected user equipment appropriate co-signatures. 图3示意性地图示了根据一个实施例的可能的设备到设备级别用户。  FIG 3 schematically illustrates the device level to the user according to a possible embodiment of the device according to one embodiment. 如图3中所示出的，UE1、UE2和UE3属于公共安全组。 Shown in FIG. 3, UE1, UE2 and UE3 are public security group. UE4和UE5属于公众成员。 UE4 and UE5 belong to members of the public. 一经在具有来自任何网络的低劣无线电覆盖的区域中发生事故（被UEl目睹），UEl就可操作为发起D2D模式并且尝试发现其他的D2D用户设备。 Once the accident occurs in an area with poor radio coverage from any network (UEL be seen), UEl can operate to initiate D2D mode and attempt to discover other D2D user equipment. UEl进行操作以开始发射具有信标签名的信标，该信标签名属于与公共安全组相关联的那些信标签名。 UEl operates to start transmitting a beacon channel having a tag name, the tag name of the channel among those channels associated with a common tag name associated security group. UEl可以操作为连同该信标一起广播紧急情况消息。 UEl may operate together with the beacon broadcast emergency message. UE2、UE3、UE4和UE5在由UEl发射的信标的无线电范围内。  UE2, UE3, UE4, and the UEl in the beacon transmitted radio range UE5. 然而，仅UE2和UE3 可操作为辨识出由UEl发射的信标的签名并且因此检测到UEl的信标。 However, only the UE2 and UE3 is operable to identify the beacons transmitted by the signature of UEl and thus the detected beacon UEl. UE2和UE3能够解码由UEl发射的紧急情况消息因此来到援助UEl的持有者。 UE2 and UE3 can decode transmitted by UEl emergency assistance UEl news therefore came to the holder. UE4可以发起D2D模式并且广播具有信标签名的信标，该信标签名属于公众组并且不同于UEl使用的信标签名。  UE4 may initiate D2D mode and broadcasts a beacon channel having a tag name, the tag name of the channel in the public group and different from the channel used by the tag name UEl. UE5可以检测到由UE4发射的信标并且与UE4建立无线电链路。 UE5 can be detected by the beacons and UE4 and UE4 emitted radio link is established. 图4示意性地图示了根据一个实施例的可能的设备到设备级别用户操作。  FIG 4 schematically illustrates a device level to a user operation according to a possible embodiment of the device according to one embodiment. 在图4 中，UE-S1、UE-S2、UE-S3、UE-S4 和UE-S5 属于公共安全组，而UE-P1、UE-P2 和UE-P3 属于公众组。 In FIG. 4, UE-S1, UE-S2, UE-S3, UE-S4 and UE-S5 are public security group, and the UE-P1, UE-P2 belongs to the public, and UE-P3 group. 发生了一个事故并且公共安全组的成员连同公众的成员一起到达现场。 The occurrence of an accident and member of the Public Safety Group, together with members of the public arrived at the scene together. 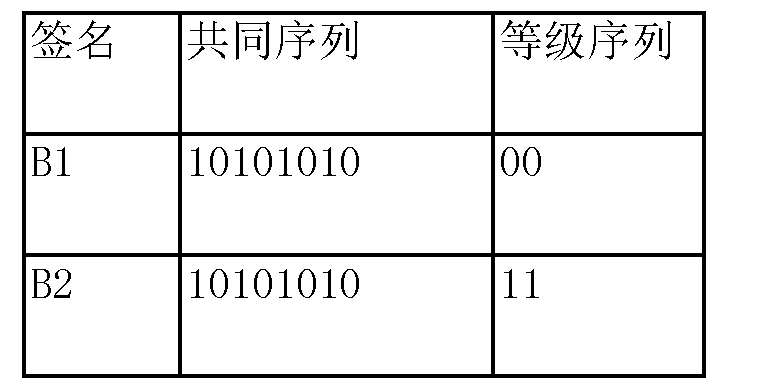 表格1中示出了一种可能的公共安全信标签名。  Table 1 shows a possible public safety beacon signature. 如在表格2中示出了一种用于公众的可能的信标签名（例如，由运营商所配置）。  As Table 2 shows a possible tag name for a public channel (e.g., as configured by the operator). 在所示出的示例中，UE-Sl和UE-S2正在分别发射信标Bl和B2。  In the illustrated example, UE-Sl and UE-S2 emit a beacon is Bl and B2. UE-P2正在发射ί目标B3。 UE-P2 is transmitting ί goal B3. UE-Sl是高等级警察并且充当联系点或者组送信者（group bearer)，因为所有其他的公共安全用户设备可操作为成功地解码UE-Sl的信标签名，并且辨识出UE-Sl具有比它们自己的等级更高的等级。  UE-Sl is a high level and acts as a point of contact police or messenger group (group bearer), because all other public safety user device is operable to successfully decode the beacon signature UE-Sl, and identify UE- Sl higher than their own grade level. UE-S2和UE-S4因此可操作为与UE-Sl建立D2D无线电链路。 UE-S2 and UE-S4 and thus operable to establish a UE-Sl D2D radio link. UE-S4在由UE-Sl支持的覆盖地区之外，但是与UE-S2形成设备到设备无线电链路连接。 UE-S4 in the area covered by the support of UE-Sl outside, but with the UE-S2 forming apparatus to a radio link connection device. 因此，公共安全用户彼此具有通信链路。 Thus, the user has a public safety communications link with each other. UE-P3与UE-P2形成设备到设备通信链路。  UE-P3 formed with UE-P2 device to device communication link. 可能例如由医师持有的UE-S5到达现场并且需要与公共安全组建立无线电链路。  may be held by a physician, for example, UE-S5 reach the site and the need to establish a radio link with the Public Safety Group. UE-S5如图4中所示出的定位在由UE-SUUE-S2和UE-P2中的每个所发射的信标的覆盖之内。 UE-S5 positioned as illustrated within the coverage by the beacon UE-SUUE-S2 and UE-P2 emitted by each of the 4 in FIG. UE-S5可操作为搜索具有被指配给公共安全组的共同签名（即，10101010)的信标，并且由此避免了浪费资源于尝试与UE-P2建立设备到设备无线电链路。 UE-S5 is operable to search for a common signature groups assigned to public safety (i.e., 10101010) beacon, and thereby avoiding waste of resources and try to establish a device-to-device UE-P2 radio link. UE-S5检测到两个属于公共安全组的签名，即信标Bl和B2。 UE-S5 detects signatures belonging to public safety two groups, i.e., the beacon Bl and B2. 因为Bl比B2更高等级，所以UE-S5与正在发射信标Bl的UE-Sl建立D2D无线电链路。 Because Bl, and so the UE-S5 D2D radio link being established higher level than B2 transmit the beacon Bl UE-Sl. 根据第一种方法，该设备可以操作为发射具有签名的信标，该签名指示这样的设备立即要求援助，也就是说，该信标签名可以指示S0S。  According to a first method, the device may be operated to transmit a beacon having a signature, the signature indicative of such apparatus requires immediate assistance, that is, the tag name may indicate a letter S0S. 属于公共安全人员的用户设备可以操作为检测这样的紧急情况信标签名，并且如果检测到，则将立即发出警报。 The public security personnel may operate user equipment for emergency beacon signature such detection, and if detected, will immediately alert. 通信可以建立在公共安全警察用户设备与该智能设备之间以援助事故地点。 Communication can be established between the user equipment and public security police the smart device to aid the accident site. 根据第二种方法，该设备可以操作为监测D2D信标，尤其是具有属于公共安全组的信标签名的那些D2D信标。  According to a second method, the device may operate to monitor the beacon D2D, especially those having a D2D beacon channel groups belonging to public safety tag name. 这样的监测可以更好地保存设备电池电源并且可以按DRX方式加以执行。 Such a monitoring device can better preserve battery power and may be performed in DRX mode. 在该地区内执行定期检查的警察将总是开启他们的信标，从而在紧急情形中的任何设备都可以检测到适当信标并且对其进行响应。 Perform periodic checks in the area of ​​police will always open their beacon, so that any device in emergency situations are appropriate beacons can be detected and in response thereto. 所描述的方面和实施例可以允许能够进行D2D的用户设备识别要与之建立通信链路的用户设备的适当D2D组。  The described aspects and embodiments of the appropriate D2D group may allow the user equipment identification can be performed with the D2D user equipment to establish a communication link. 多个方面和多个实施例可以按如下的方式来允许在一组D2D用户设备内的协调，该方式可以避免多个干扰信标的发射。 The various aspects and embodiments may be a plurality of embodiments in the following manner to allow a set of coordination within the D2D user equipment in a manner to avoid interference plurality of transmission of a beacon. 本领域的技术人员将会容易认识到，各种上面所描述的方法的步骤能够由经编程的计算机来执行。  One skilled in the art will readily recognize that steps of the methods described above can be performed by a variety of programmed computer. 在本文中，一些实施例还意图为覆盖程序存储设备，例如，数字数据存储介质，它们是机器或计算机可读的并且编码指令的机器可执行或计算机可执行程序，其中所述指令执行所述上面所描述的方法的步骤中的一些步骤或者全部步骤。 Herein, some embodiments are also intended to cover program storage devices, e.g., digital data storage media, which are machine or machine-executable or computer-readable and computer-executable program of coded instructions, wherein said instructions perform the Some of the steps or all steps of the method step described above in. 这些程序存储设备可以是，例如，数字存储器、诸如磁盘和磁带的磁存储介质、硬驱动器、或者光可读数字数据存储介质。 The program storage devices may be, e.g., digital memories, magnetic storage media such as magnetic disks and magnetic tapes, hard drives, or optically readable digital data storage media. 这些实施例还意图为覆盖被编程为执行上面所描述的方法的所述步骤的计算机。 These embodiments are also intended to cover computers programmed to perform said steps of the method described above. 附图中所示出的各种元件的功能，包括被标记为"处理器"或"逻辑"的任何功能框，可以通过使用专属硬件以及能够执行软件的硬件与适当软件的联合来提供。  shown in the drawings functions of the various elements, including any functional blocks labeled as "processors" or "logic", can be combined through the use of dedicated hardware as well as hardware capable of executing appropriate software and the software provide. 当由处理器提供时，这些功能可以由单个专属处理器、由单个共享处理器、或者由多个个体的处理器(其中的一些可以是共享的）来提供。 When provided by a processor, the functions may be by a single dedicated processor, by a single shared processor, or by a plurality of individual processors (some of which may be shared) is provided. 此外，对术语"处理器"或"控制器"或"逻辑"的明确使用不应当被解释为排他地指代能够执行软件的硬件，并且可以隐含地不带限制地包括：数字信号处理器（DSP)硬件、网络处理器、专用集成电路（ASIC)、现场可编程门阵列（FPGA)、 用于存储软件的只读存储器（R0M)、随机访问存储器（RAM)、和非易失性存贮器。 Moreover, explicit use of the term "processor" or "controller" or "logic" should not be construed to refer exclusively to hardware capable of executing software, and may implicitly include, without limitation: a digital signal processor (DSP) hardware, network processor, application specific integrated circuit (ASIC), a field programmable gate array (the FPGA), read only memory for storing software (R0M), a random access memory (RAM), and nonvolatile memory reservoir. 其他常规的和/或定制的硬件也可以被包括。 Other conventional and / or custom hardware may also be included. 类似地，附图中所示出的任何开关都仅是概念性的。 Similarly, any switches shown in the figures are conceptual only. 它们的功能可以通过程序逻辑的操作、通过专属逻辑、通过程序控制和专属逻辑的交互、或者甚至手动地来执行，特定的技术是由实施者在更加具体地从上下文进行理解时可选择的。 Their function may be, through dedicated logic, through the interaction of program control and dedicated logic, or even manually performed by operation of program logic, the specific technique is selectable by the implementer when more specifically understood from the context to be performed. 本领域的技术人员将意识到，本文的任何框图表示了体现本发明的原理的说明性电路的概念视图。  Those skilled in the art will appreciate that any block diagrams herein represent conceptual views embodying the principles of the present invention is illustrative circuitry. 类似地，将意识到，任何流程图表、流程图、状态转换图、伪代码等表示了各种过程，这些过程可以基本上被表示在计算机可读介质中并且所以由计算机或处理器执行，不论这样的计算机或处理器是否明确地被示出。 Similarly, it will be appreciated that any flow charts, flow diagrams, state transition diagrams, pseudocode, and the like represent various processes which may be substantially represented and so executed by a computer or a processor in a computer-readable medium, whether whether such computer or processor is explicitly shown. 本描述和多个示图仅说明了本发明的原理。  The present description and the plurality diagram merely illustrates the principles of the present invention. 将因此意识到，本领域的技术人员将能够设计出尽管本文没有明确描述或示出但是体现了本发明的原理并且被包括在其精神和范围内的各种布置。 It will thus be appreciated that those skilled in the art will be able to devise principles although not explicitly described or shown herein, embody the present invention and various arrangements included within its spirit and scope. 此外，本文所记载的所有示例主要明确地意图为仅用于教导的目的， 以辅助读者理解本发明的原理和由（多位）发明人为了促进本领域所贡献的概念，并且将被解释为没有对这样明确记载的示例和条件做出限制。 In addition, all examples recited herein are expressly intended to be primarily used for teaching purposes only, to assist the reader in understanding the principles of the invention and by the (number of) the inventor to furthering the art concepts contributed, and will be interpreted as no limits on the conditions of such examples and clearly documented. 此外，记载了本发明的原理、方面、 和实施例的本文的所有陈述，以及它们的具体示例，意图为涵盖它们的等价物。 Further, according to the principles of the invention, aspects, and all of the embodiments set forth herein, as well as specific examples thereof, it is intended to encompass equivalents thereof. 1. 一种在无线通信网络内的被配置为经由直接无线电链路与其他用户设备进行通信的用户设备之间建立关联的方法，所述方法包括： 在被配置为经由直接无线电链路进行通信的所述用户设备中的一个用户设备处，监测对来自所述其他用户设备中的一个用户设备的信标信号的接收； 如果接收到这样的信标信号，则向发射所接收的所述信标信号的所述用户设备通告接收到所述信标信号，来与发射所接收的所述信标信号的所述用户设备建立关联；以及如果没有接收到信标信号，则开始发射信标信号并且监测对发射的所述信标信号已经被所述其他用户设备中的一个用户设备接收到的通告的接收，来与负责发射所述通告的所述其他用户设备建立关联。 1. A wireless communication network is configured to establish a correlation between the user equipment communicates via a radio link directly with another user device, the method comprising: being configured to communicate via a direct radio link the user equipment at a user equipment, a monitoring and receiving from said user equipment to other user equipment the beacon signal; if such a received beacon signal is transmitted to said received channel the user equipment receiving the announcement beacon signal the beacon signal to the user equipment and transmitting the beacon signal received in association; and if not received the beacon signal, the beacon signal begins transmitting and monitoring said beacon signal has been transmitted to the announcement received by the receiving device a user to other user equipment, to transmit the advertisement charge of the other user equipment associated with. 2. 根据权利要求1所述的方法，其中所述关联包括：在接收到信标信号的所述用户设备与发射所述信标信号的所述用户设备之间建立直接无线电链路。 2. The method according to claim 1, wherein the association comprises: establishing a direct radio link between the received beacon signal from the user equipment and the user equipment transmits the beacon signal. 3. 根据权利要求1或权利要求2所述的方法，其中所述关联包括：由发射所述信标信号的所述用户设备维护的用户设备集群列表的成员资格，所述集群列表包括发射所述信标信号的所述用户设备与之具有直接无线电链路的用户设备的列表。 3. The method according to claim 2 or claim 1, wherein the association comprises: membership lists a list of clusters of the cluster of the user equipment maintained by the user equipment transmitting the beacon signal comprises transmitting the the user equipment of said beacon signal with a list of user equipment having a direct radio link. 4. 根据任一项前述权利要求所述的方法，进一步包括：交换在接收到信标信号的所述用户设备与发射所述信标信号的所述用户设备之间建立的所述直接无线电链路的无线电条件的指示符。 4. The method according to any preceding claim, further comprising: switching between said received beacon signal of the user equipment and the user equipment transmits the beacon signal to establish a direct radio link indicator radio conditions of the road. 5. 根据权利要求4所述的方法，其中如果在接收到信标信号的所述用户设备与发射所述信标信号的所述用户设备之间建立的所述直接无线电链路的无线电条件的所述指示符满足边缘准则，则接收到信标信号的所述用户设备由发射所述信标信号的所述用户设备指令为开始发射它自己的信标信号。 The method according to claim 4, wherein if the radio conditions established between the received beacon signal of the user equipment and the user equipment transmits the beacon signal of the direct radio link the indicator satisfies edge criterion, then the received beacon signal the user equipment by the user equipment the beacon signal transmitting instructions to start transmitting its own beacon signal. 6. 根据权利要求4或权利要求5所述的方法，包括：确定无线电条件的所述指示符是否没有满足链路维持准则，并且如果没有，则终止在接收到信标信号的所述用户设备与发射所述信标信号的所述用户设备之间建立的所述关联。 6. The method of claim 5 according to claim 4 or claim 5, comprising: determining whether the radio condition is not satisfied the indicator link maintenance criteria, and if not, terminating the user device receiving the beacon signal and the link between the user equipment transmits said beacon signal and. 7. 根据任一项前述权利要求所述的方法，其中在由发射所述信标信号的所述用户设备维护的集群列表内的被配置为经由直接无线电链路与其他用户设备进行通信的用户设备之间的直接无线电链路通信，经由发射所述信标信号的所述用户设备，在所述集群列表内的用户设备之间被路由。 The method according to any one of the preceding claims, wherein the cluster within the list maintained by the user equipment to transmit the beacon signal is configured for the user communicating via a direct radio link with other user equipment a direct link between the radio communication apparatus, via the user device transmitting the beacon signal, is routed between the user equipment within the cluster list. 8. 根据任一项前述权利要求所述的方法，其中对关联的所述建立包括：请求与发射所述信标信号的所述用户设备建立直接无线电链路，并且等待对建立所述请求的直接无线电链路的确认。 The method according to any one of the preceding claims, wherein for establishing the association comprises: requesting establishment of a direct radio link with the user equipment transmits the beacon signal, and waits for the request for the establishment of direct radio link confirmation. 9. 根据权利要求8所述的方法，其中所述请求包括在所述接收用户设备处所接收的信标信号的强度的指示。 9. The method according to claim 8, wherein said request includes an indication of the intensity received at the receiving user equipment the beacon signal. 10. 根据任一项前述权利要求所述的方法，其中对关联的所述建立包括：从发射所述信标信号的所述用户设备接收与被包括在所述集群列表中的用户设备有关的信息。 10. A method according to any one of the preceding claims, wherein the association of establishing comprises: receiving the user device transmitting the beacon signal from the associated user equipment includes said cluster list information. 11. 根据任一项前述权利要求所述的方法，其中发射信标信号的用户设备指令它已经与之建立关联的用户开始发射信标信号。 11. The method according to any one of the preceding claims, wherein the user equipment transmits a beacon signal of an instruction that it has associated with the establishment begins transmitting user beacon signal. 12. 根据任一项前述权利要求所述的方法，其中监测对来自所述其他设备中的一个设备的信标信号的接收包括：监测来自所述其他设备中的一个设备的包括所选择的用户类型签名的信标信号。 12. The method according to any one of the preceding claims, wherein a monitoring device receiving from the other devices of the beacon signal comprises: monitoring a user comprising a selected device from the other devices of type signature beacon signals. 13. 根据任一项前述权利要求所述的方法，其中所述信标信号包括等级的指示，并且在用户设备处接收到多于一个信标信号的情况中，所述方法进一步包括：评估与信标信号相关联的所述等级的指示，并且向发射被评估为具有最高等级的接收的所述信标信号的所述用户设备通告接收到所述信标信号，来与发射具有所述最高等级的接收的所述信标信号的所述用户设备建立关联。 13. The method according to any one of the preceding claims, wherein said beacon signal includes an indication of the level, and receives the case of more than one beacon signal at a user equipment, the method further comprising: evaluating the letter the level indication associated with the beacon signal, and evaluated to transmit the user equipment to receive the advertisement having the highest level of the received beacon signal to the beacon signal, and to transmit having the highest ranking the user equipment receiving said beacon signal in association. 14. 一种计算机程序产品，当在计算机上执行时操作为执行根据权利要求1至13中任一项所述的方法。 14. A computer program product, when executed on a computer operable to perform a method according to any one of claims 13 to claim. 15. -种在无线通信网络内的操作为经由直接无线电链路与其他用户设备建立关联的用户设备，所述用户设备包括： 监测逻辑，被配置为监测对来自所述其他用户设备的信标信号的接收； 通告逻辑，被配置为如果接收到这样的信标信号，则向发射所接收的信标信号的所述其他用户设备通告接收到所述信标信号，来与发射所接收的所述信标信号的所述用户设备建立关联；以及发射和接收逻辑，被配置为如果没有接收到信标信号，则开始发射信标信号并且监测对发射的所述信标信号已经被所述其他用户设备接收到的通告的接收，来与负责发射所述通告的所述其他用户设备建立关联。 15. - species within the wireless communication network is operable to associate the user equipment via a direct radio link to other user equipment, the user equipment comprising: monitoring logic is configured to monitor channel from the other user equipment scale received signal; announcement logic configured to, if such a received beacon signal, the beacon signal is received advertisement to other user equipment transmit said beacon signal is received, the receive and transmit to the the user equipment of said beacon signal associated; and transmitting and receiving logic is configured to, if the beacon signal is not received, then begins transmitting the beacon signal and monitors the beacon signal has been transmitted to the other receiving a notification received user equipment is responsible for association with the advertisement transmitting the other user equipment.